Marketing starts with the first phone call to your office. Your receptionist should be answering the phone as follows: "Dr. Johnson's Office, General Dentistry and Orthodontics, this is Lisa, how may I help you?" Notice you add, and Orthodontics when the phone is answered. Don't take it for granted that your current patients know you do orthodontics. The fact you do orthodontics should also be apparent from signage on your building and from signage and pictures or posters within your building. Use photos of your actual patients (with their signed consent) and keep all signage simple, fun, and eye-catching. Our reception area has a large mural-type display with beautiful canvas-wrapped photos of my patients' smiles. These were professionally done and are much more effective than typical stock images that you purchase from a catalogue. You need to be cognizant of what the ethics rules are in your state concerning what a general dentist can display or advertise concerning orthodontics. I contacted my state's ethics committee before I spent any money on a logo or advertising pieces. Also, put up any continuing education class certificates that you have earned in orthodontic studies. Make sure these certificates are in a central location that can be seen by your general dentistry patients. Too many times, dentists only put the certificates in their consultation room, so they are only seen by patients going through the orthodontic evaluation process, not by all of their general dentistry patients. Your patients look at these and want to know your credentials. We do everything possible at our office to make our patients' orthodontic experience fun. This starts with customized orthodontic new patient questionnaires (see example 1). (2) It is so much easier going into a consultation knowing something about your patient. Not only do you connect better with the patient (which is essential for cooperation), but the parents love the fact that you care about their children and are interested in them. I spend the first 2-3 minutes of any new patient evaluation asking questions about their interests that was noted on the questionnaire. My treatment coordinator also has a sign in the consultation room welcoming new patients with their names on the sign. (3) Parents love to hear their childrens' names mentioned, so it is essential that you mention the patient's name as often as possible during the consultation. The sign helps me remember their names, especially with some of the more uncommon names that are now given to children. During the consultation, we mention everything that is included with treatment. It is important to "bundle" all of your services together when discussing your fees. Your orthodontic fee includes the braces, all adjustments, all supplies associated with treatment, and the retainers following treatment. We also include a four month and a one year follow-up retainer check appointment. This assures the parents that you care about their children, even after treatment is completed. We also mention the retainers that are included with treatment. Most orthodontic offices do fixed lingual retainers along with clear retainers (which wear out after a few years). (4) We give clear daytime retainers and a nighttime Hawley-type of retainer (at no extra charge) to make sure they have proper retention for many years following treatment. You need to stress the differences between your treatment and that of the practitioner down the block. In the consultation room, we have a 36 inch screen with a scrolling program of before and after pictures, patient testimonials, and services that we provide. This is ideal for the patients and parents to view whenever the treatment coordinator is out of the room. While in the room, the patient's photos are displayed on the screen. Being on a large screen really emphasizes any orthodontic problems and makes it much more apparent when treatment is required. During the consultation, the treatment coordinator mentions all of the fun things we offer our orthodontic patients. This sparks the interest of the patients and makes them want to do treatment at your office. You will be under constant competition from your area orthodontists who have video games in their reception rooms and offer prizes for good performance to their patients. You need to make it fun for your patients, otherwise they will want to go to another office and won't cooperate with your treatment. Even your most trusted patients of record may go to the orthodontist if the orthodontist's office is perceived as being "more fun." Yes, you need to be a good clinician, but in 2016, children have a lot of influence on where they want to go for treatment, and it's all about fun and entertainment. We offer Paschen Bucks' for good performance (see example 2). This is an inexpensive way to get your patients involved through a variety of contests and incentives. We offer Paschen Bucks for: excellent oral hygiene, keeping brackets on, being on time to appointments, good grades in school, birthdays, getting regular teeth cleanings and check-ups, participating in our monthly contests, writing a review, checking into Facebook, and many other things. The Paschen Bucks are then used to purchase prizes at the Paschen Store. It is much like an arcade where tickets are issued, with each prize in the store being associated with a number of Paschen Bucks. Prizes range from pizza parties and gift cards to stuffed animals and water bottles. The Paschen Store is a glass cabinet filled with the items and is on full display in our reception area. Again, this is great marketing which is seen by your general dentistry patients. Our monthly calendar dress-up contests (6) have been a huge hit with our patients and really emphasize the "FUN" we have. Every month has a theme, and we offer Paschen Bucks for our patients who dress up in the spirit of the monthly theme. For example, we may have Superhero Month, Pajama Month, Favorite Sports Team Month, Hat Month, Ugly Sweater Month, Mismatch Month, etc. We will also decorate the office to match the month. Patients who dress up not only get Paschen Bucks, but we put their photos on our Paschen Orthodontics Facebook page. Of course we make a huge deal when they wear their outfits, which the parents love. Our team also dresses for the monthly theme, one day each week, and we post our team photo on our Facebook page. Dressing up, having fun incentive prizes, and decorating your office is a sure way to attract your general dentistry patients and make them "want" to do their orthodontics at your office (and they will tell their friends how fun your office is). We have a Sparkling Smile Club which is ideal for your patients of record. I have found many times that patients who are in orthodontics fail to keep their regularly scheduled cleaning appointments. Patients feel that their teeth cannot be professionally cleaned during orthodontics or that the dentist checks for cavities each time they come in for their orthodontic adjustment. The Sparkling Smile Club is an incentive and reminder to keep those patients on a regular cleaning schedule while in orthodontic treatment. There is a separate display in our reception area which showcases the fantastic prizes that are available to any of our orthodontic patients who have recently had a cleaning and check-up. Besides receiving Paschen Bucks for their regular check-ups, these patients are entered into a special monthly drawing and can win sports tickets, electronics, movie certificates, dinner gift cards, and other prizes. The Sparkling Smile Club is also open to our patients who are not yet ready to start treatment (those in the recall system). This is another great way to keep them connected to your orthodontic department. During the initial consultation, the treatment coordinator explains all of these contests, the Sparkling Smile Club, as well as the Paschen Bucks. Our recall patients are also given T-shirts with our logo on them and encouraged to wear them into their activities that you choose to do. This person has to be energetic and creative. Figure out a monthly budget that he or she can spend and give them carte blanche on their ideas, keeping in mind that everything has to be approved by you (the dentist) before going forward. I had a situation one month where my team had picked out "cheap" chocolates to give away as a monthly contest prize. I quickly changed the prize to Godiva chocolates, which look much better when posted on our Facebook page (we post all of our winners). Internal marketing is usually inexpensive, but never go the cheap route. I hope this article has given you a lot of good ideas on how to motivate and attract your general dentistry patients to the orthodontic side of your practice. As always, should you have any questions, please feel free to e-mail me at the address below. Put "IA0 Journal Article" in the subject line. The next article in this series will focus on the team. I will show how you can better bond with your team and help them to work to their full potentials. I will also discuss some typical problems that may occur in your office and how to respectfully deal with those issues. By being an effective leader and having a motivated team, you will have more fun at your office, which will translate into a more productive practice. Dr. Mark D. Paschen graduated from the Marquette University School of Dentistry in 1983. His "passion" has always been practice management, giving his patients extraordinary service. After years of incorporating orthodontics into his general dentistry practice, his practice is now focused solely on orthodontics, TMD, and Sleep. He credits much of the success of his practice to not only furthering his clinical skills, but also to his close attention to practice management implementation. Dr. Paschen has lectured extensively in the United States and also in Sydney, Australia. He is a Senior Certified Orthodontic Instructor for the IAO. 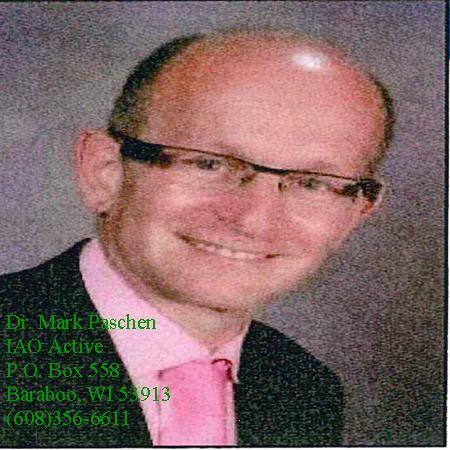 To reach Dr. Paschen please e-mail drmarkpaschen@gmail.com.